Fan mail #1: Moving on to the e-mails, a listener asked about the girls’ sleeping postures. (It has actually been asked before on FM FUJI GAKI-KAME and I think their answers are the same.) Gaki-san sleeps face-down although she’s trying to change it because she’s heard it isn’t good for your stomach. Eri sleeps on her side with her hands between her thighs — or, as Eri would describe it, she has the sleeping posture of an old man. Fan mail #2: Another listener who has been e-mailing Gaki-Kame since the start of their first radio show noticed that all of his mails were always read out by Eri, even this one! (The girls normally alternate reading the mails so it’s based on luck.) This is probably the last e-mail he’ll be able to send to Gaki-san and Eri so he’s listening to this episode as it airs to see if his last mail will be read by Eri, too. He says that he’ll continue sending e-mails to Gaki-san so she’ll finally be able to read his mails, and he tells Eri to work hard on her recovery. He will be supporting her and waiting for her to come back. Fan mail #3: The third listener asks Eri about the entry Sayu made on her blog about Eri exceeding her credit card limit. He asks why she can’t control herself and if Eri Mama got mad at Eri. Eri says that her mommy didn’t get mad at her because she’s already given up on trying to change her shopping habits. Gaki-san, commenting on the part about “why she can’t control herself,” tells Eri that she pissed her fan off at the very end of her Morning Musume career. Eri promises to have better control of herself from now on. Fan mail #4: A listener asks the girls to choose one word to sum up this past year. Eri chose 優 (“kindness“) because she really felt it all the way ever since her graduation announcement was made. (Eri originally said “yasa” which is from “yasashii” (kind) and Gaki-san kindly corrected her; although it’s the same kanji, it should be “yuu” because “yasa” without the “shii” is a prefix.) For Gaki-san, 変 “change” is the word to sum up her year. A lot of things have changed positively, including the feelings of all of the eight members towards one another. Fan mail #5: The fifth listener asks Gaki-Kame if their dreams/wishes have ever come true without even putting much thought into them. They both say that they are sometimes pretty lucky: there are times when they want something and someone just coincidentally happens to give it to them as a gift. Fan mail #6: The next listener reminds Eri that she once said on a previous episode that she wants to wear cartoon character costumes, and they realized Eri has never worn a turtle costume before — although she has worn a cow costume, a monkey costume, and more. Gaki-san suggests that Eri wear a turtle costume for her graduation ceremony while everyone else is wearing nice dresses. Eri’s response to that: “let me graduate beautifully!” Eri says she will one day wear a turtle costume and asks everyone to continue wishing for it. Fan mail #8: The eighth listener asks them what they would award FIVE STARS to right now. (They used to have a segment called MY FIVE STARS where they gave FIVE STARS to stuff.) Eri has been eating fish-paste cake lately, and Gaki-san notices that all the edible items Eri awards FIVE STARS to are never idol-like, which Eri admits to, too. Gaki-Kame both want an iPod Touch. Fan mail #10: Last e-mail! It’s redundantly long so to summarize: all he wanted was advice from the girls. (Eri took two minutes just to finish reading his mail.) Gaki-san advises him to think about his future and his partner, just like how Eri thinks about her friends before making a decision. Eri tells him that if he has the passion for something, it’s okay for him to work towards it. They were asked to give their final words to the listeners and Gaki-san immediately started crying and Eri was choking up. They have been hosting this show for approximately a year and eight months — although it didn’t feel that long. They were both overjoyed when they were told they would be the regular hosts of FM Fuji GAKI-KAME. At the time they weren’t really seen as a duo by fans yet, but gradually, the two of them were given a lot of opportunities to work together. They were really sad when they ended FM Fuji GAKI-KAME, but a year later they were given another opportunity together: hosting FIVE STARS Monday… until Eri’s graduation. 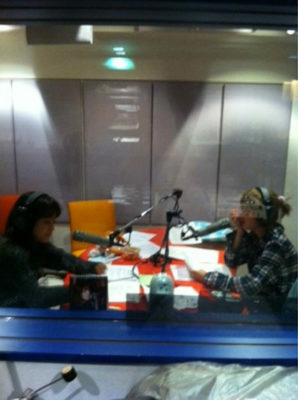 After Morning Musume became a 8-person group, Gaki-san and Eri haven’t gotten as many chances to work together anymore — except for this radio show. Every time they host the show together, they laugh so much and have lots of fun together. They are very thankful for the opportunity. Eri has been relying on Gaki-san to host this radio show most of the time so it’s very easy for her to be all relaxed and have fun. Both of them goof around so much that they get tired from all the laughing. Apart from that, hearing that fans too have enjoyed their radio show makes it even more important than it already is. Eri doesn’t have a blog, so this radio show is her outlet for expressing all her thoughts and feelings. All the messages sent to them about the radio show, about them being the ultimate duo, about ANYTHING, have made them really happy — it’s what let them know that they have people supporting them. What would make them even happier is if 10 years down the road when somebody asks you “what’s your favourite radio show?,” you would start talking about a certain radio show that ended 10 years ago. They hope that people will still remember this show even then. This radio show is a kind of a funhouse for them; every time they come to the studio, it’s like “I’m home!,” so they are very thankful to everyone who made it possible. Since both of them started crying around the same time, they both have to smile through the closing talk. They decided to also make the doll laugh as they end the show. Happy birthday to Kamei Eri! This project was truly a labor of love if there ever was one. It was so good to jump back in time with these two. I hope you enjoyed it as much as I did. If you want to reread this show from the beginning, or if you’re someone who hasn’t even started yet, see this post for a full index. Also, apart from the index above, it seems likely that this will be the final post on the site — I’m not planning on taking on another show to translate, nor are any of the existing contributors to my knowledge. But as always, if anyone reading this thinks they might be interested in contributing, leave a comment or just message me directly. That’s it for now. Thank you for reading Hello! Pro Radio. Thank you both Henkka and OnDiet for translating all the Five Stars shows. Even without new translations I hope the site stays up, cause I’m pretty sure I’ll have the urge to read everything again in a few months. Thanks for reading. Don’t worry: the site will stay up. Thanks to all the translators for this site. The format was very easy to read and the sound slips were a fun bonus. Not to mention that this (and an old post somewhere by Henkka) was what convinced me to listen to entire radio show series in an effort to learn a bit of Japanese. That’s cool. I wish you all the success with your language learning. I remember listening to this very show back in 2009 or 2010 when I was just starting to learn Japanese… At first I could understand hardly a thing, but dammit if I wasn’t entertained just listening to these two stupidly giggle about something, even if I didn’t always grasp what that something was. Any language learning material that doesn’t bore your brains out is good language learning material.